Before I delve into more of the social nuances and science on the health impacts of these variations of a plant-based diet, here are my views on the word vegan. I have tended to avoid the word—as I do vegetarian as well. These ‘V’ practices have mostly been driven by ideologies based on ethical considerations, which are certainly good and sufficient rationales for many people. I am not saying that we have factual evidence that the WFPB (whole food, plant-based) diet works for everyone for all conditions all the time. It is a matter of weight of evidence, not certainty of proof. Said another way, the odds of achieving health both short and long term for the WFPB diet are so high that it seems foolish not to use it. How pure must a diet or lifestyle be to qualify as vegetarian or, for that matter, vegan? How about a whole food, plant-based diet? This question of so-called purity continues to hover over many discussions of these practices. This has also prompted the question of how pure a whole food, plant-based (WFPB) diet must be to maximize human health. This is usually stated as “how pure must a vegan diet be?” This depends on perspective. If choosing plants for our daily fare is done for ethical reasons, I would think people would want to be 100%. Otherwise, how could one say, “I think I’ll be 95% or 90% ethical and 5-10% unethical”? For years I have responded to this purity question that the closer we get to a 100% whole food, plant-based diet, the healthier we will be. It may surprise some, but I am not aware of any verifiable evidence that 100% vegan purity is needed to optimize health for all people at all times. We must consider how addictions to dietary fat and refined carbohydrates, for example, impact one’s ability to eat just a little and still stay on the whole food, plant-based path. If someone wanted to quit smoking, experience has shown that it would be difficult to cut back to 5% of the cigarettes they did before they quit, because they would likely revert back to their previous unhealthy habit. Tastes often change with a prolonged absence of addictive substances, and for some 100% purity is the best way to do this. But before I delve into more of the social nuances and science on the health impacts of these variations of a plant-based diet, here are my views on the word vegan. I have tended to avoid the word—as I do vegetarian as well. These ‘V’ practices have mostly been driven by ideologies based on ethical considerations, which are certainly good and sufficient rationales for many people. My motivation for eventually questioning the Standard American Diet (SAD) was based on science. When I began my experimental research program almost 60 years ago, I didn’t even know of the words vegetarian or vegan. I was only interested in doing scientific research on diet and health. On the farm where I was raised, everyone believed that meat, milk and eggs—the main sources of protein—should be at the center of our plates. 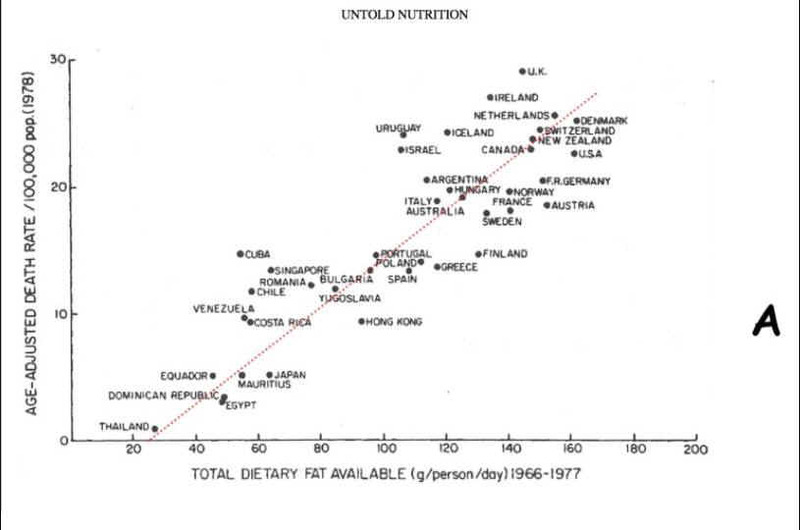 In my graduate research and teaching programs, protein also was often at the center of discussions on nutrition. Within a decade or so, our studies started to point to a very different conclusion on protein. This gradually became provocative, and it prompted the need for differentiating a whole food, plant-based diet from vegetarianism. I had to wonder: Were our experiments on diet and health properly designed? Were the results being properly interpreted, especially our findings on the promotion of cancer by dietary protein? If this protein effect was true, then why had I, like so many others, been in the dark for so long? Although this new evidence certainly trended toward the health benefits of vegetarian and vegan practices, it was not the same. Like today, most vegetarians consumed animal protein such as dairy and eggs and many occasionally ate fish. I was later to learn that vegans avoided using all animal products for food and clothing, and their diets often included highly processed products made from refined carbohydrates, added fat and excess salt. I began to see that it was the nutrient composition of a diet that explains its effect on health promotion and disease prevention. This diet was low in protein, low in fat and rich in plant-based foods—in their whole food form. I therefore thought there should be a name for a diet that reflected these foods: a whole food, plant-based (WFPB) diet. Our research findings, from many experiments, confirmed that animal protein increased cancer development in laboratory rats and mice, no matter which way we examined it. More questions arose. Was it possible that other nutrients might cancel a protein effect? Were our experimental results specific only for a certain kind of cancer and only for a certain species? And how big must an effect be before it becomes really important for us to take seriously? Still more questions and experiments cropped up as these studies were taking place, and the findings were even more impressive and significant than I first expected. Moreover, they were supported by human study evidence. By the time our program was about 20 years old (around 1985), I had given much attention to the scientific basis for vegetarianism. I found that this dietary practice was not taken seriously in the scientific community. It was about 1990 when I began to consider the fundamental science underlying vegetarian diets. The evidence on vegetarianism published at that time was somewhat favorable to human health, but it was not entirely convincing. I tell this bit of personal history to make two points. First, my rationale for choosing hypotheses and designing experiments was based on curiosity, not animal welfare concerns or other ethical considerations. Second, we had to be aware of personal prejudices. We had to conduct experimental research especially carefully to be awarded renewed funding and get published in a competitive environment where only 16% of such proposals were being funded. We also had to answer mounting questions from skeptics about our research findings. In 1990, the vegetarian and vegan communities, among others, became enthused about our evidence when it was reported in a lead article in the science section of the New York Times. This was when plant-based Drs. McDougall, Esselstyn and Ornish (in that order) also told me about their impressive experiences with their (human) patients, thus helping to corroborate our basic research. But the more traditional scientists within my research community seemed to have little or no interest, and their disinterest has continued to the present day. It became quite clear to me that considering vegetarianism in the early 1990s was unusually contentious, even more so for the concept of veganism. The public dialogue that arose at that time seemed to be unusually polarizing, thus prompting the question of the purity of one’s veganism. This all-or-nothing tendency created a difficult environment for objective reasoning of the scientific evidence. I therefore have preferred the WFPB nomenclature because it focuses on objective science (if there is such a thing), not on personal values that arise from ethical argument—however treasured these beliefs may be. Also, a WFPB diet is better described as a ‘dietary lifestyle’ not a ‘diet’ because of the vast and very important interplay of food, exercise, personal philosophy and environment. In this discussion, therefore, I have been rejecting the tendency to say that vegan and vegetarian diets are synonymous with the WFPB dietary lifestyle. As previously stated, a vast majority of vegetarians still use copious amounts of dairy products, sometimes also fish and eggs while most vegans use nutritionally compromised plant-based diets high in added fat, sugar and processed foods. Choosing what to eat and how to live on the basis of the scientific evidence, however, is a different perspective. I prefer not to say that we obtain absolute proof in our scientific investigations. Proof is too certain. I prefer evaluating scientific evidence on the basis of its ‘weight’. How much evidence is there? How varied is it? How big is the effect? Is experimental evidence relevant for humans? So why have I been saying, “the closer we get to a whole foods plant-based diet, the healthier we will be”? Even though there is a variety of evidence to support this statement, it is only supportive. The data below offers some of the supporting evidence for the health benefits of a WFPB diet, which approaches a 100% plant based composition. These charts show a comparison of breast cancer mortality with three kinds of dietary fat in various countries. In chart A, total fat (both animal and plant) is shown. 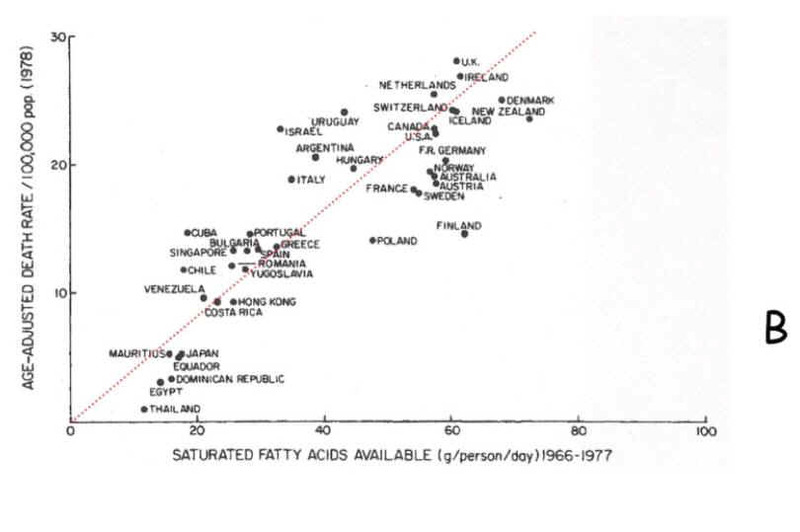 Chart B shows saturated fat consumption, which comes mostly from animal-based foods. 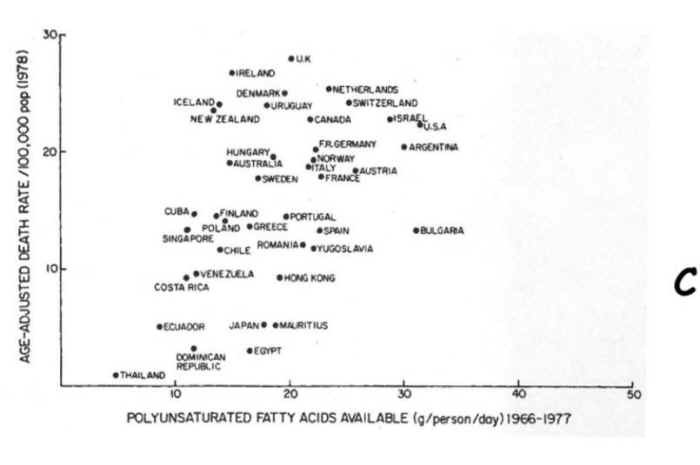 Chart C shows polyunsaturated fat consumption, which mostly comes from plant foods. Notice the relationship between fat and breast cancer mortality in charts A and B, and the lack of a relationship (signified by a straight line) in chart C.
Total fat is impressively correlated with breast cancer (A) but this is due to saturated fat typically provided by animal based foods (B), and not to unsaturated fat typically provided by plant-based foods (C). But when this information was first published, it did not make a lot of sense because there also was evidence showing that plant fat (i.e., oils) causes breast cancer development much more effectively than animal fat. But this contradiction occurred only when total fat consumption was high, as is typical for Western diets! Something more is needed and it is this. Instead of focusing on fat, the focus could be on animal protein because total fat and animal protein are highly correlated. Thus the most relevant correlation is with animal-based foods. Notice also that the regression line in chart B for animal-based food passes through the origin (i.e., zero), thus suggesting that breast cancer risk increases with very small amounts of animal-based food. As animal-based food becomes a larger share of the diet, plant-based food becomes a lesser share. Together, these simultaneous changes, containing countless nutrients, are well known to associate with the risk for breast cancer and many other degenerative diseases, i.e., lower risk for plant-based nutrients and higher risk for animal-based foods. Still, however, this does not prove causality but it nonetheless is supportive. A similar case can be made with our China Project data. Serum cholesterol ranges from an extremely low 90-170 mg/dL—whereas a comparable U.S. range is about 170-270 mg/dL. Increasing but still small amounts of animal protein consumption in China (highly significant) associates with increasing serum cholesterol. In reality, small amounts of animal-based food are associated with increasing risks for breast cancer and other Western diseases in rural China. The same is true with the U.S. and other Western countries with a much higher range of serum cholesterol. These two findings involving the consumption of very small amounts of animal food show the same result. The findings are particularly impressive when supported by multiple mechanisms explaining a powerful animal protein effect on cancer formation. When benefits are so broad and convincing with little or no downside, why not choose this diet? I am therefore entirely comfortable saying that the closer we get to a WFPB diet, the closer we get to these health benefits. Indeed, we now have data showing that intervention with this diet produces a broad and dramatic effect in a short period of time for everyday people. I am not saying that we have factual evidence that the WFPB diet works for everyone for all conditions all the time. It is a matter of weight of evidence, not certainty of proof. Said another way, the odds of achieving health both short and long term for the WFPB diet are so high that it seems foolish not to use it. This is especially wise when it minimizes environmental problems, health care costs and unnecessary violence toward other sentient beings (enslavement of animals on factory farms as if animals are mere mechanical robots waiting for slaughter is far beyond my experience where our animals had names, green pastures, and personalities!). I find it counterproductive to solely use ethical considerations to argue in favor of a WFPB diet. The ethical argument is certainly sufficient and valid for many people to choose this dietary lifestyle, but urging others to adopt this diet based on the same ethical argument, perhaps even causing them to feel unethical, is ineffective. Most importantly, it is not necessary to defend the ethical view, however appropriate it is, by incorrectly saying that science has proven its health benefits and that 100% conversion to this diet is required. This also is counterproductive. It has been my experience that much of the reluctance of my research colleagues to even be curious about this evidence relates to their belief that a WFPB dietary lifestyle really is a vegan diet. I assert that because vegan diets are primarily grounded in ethical argument, they have suffered the unnecessary indignities of the scientific community for too long. It is not that traditional scientists are avoiding the ethical issues surrounding vegan and vegetarian practices, but more that these practices are not based on acceptable science. And to some extent, I can understand their concerns because when I browse the internet for information on vegetarian and vegan diets, far too much of it is uninformed and superficial. It may be hearsay, may not be professionally published, may lack primary referencing, and may be biased by commercial interests (in the supplement industry, for example). What I am most concerned about, however, is the presentation of information as if it is proven science, up to the need to avoid every last scintilla of the wrong nutrient in our diets. By the same token, I am also troubled by the tendency of traditional, trained science professionals to be unwilling to practice what they often preach, namely, to be more open to scientific discourse, especially that which may challenge their own views. Good science must challenge one’s own views as well as institutional and cultural views that have become staid. It was the scientific basis for eating plants, not animals, that prompted me to coin the phrase “plant-based” in the early 1980s instead of using the term “vegetarianism”. I did this in order to emphasize the scientific basis for this evidence, especially for some very traditional research colleagues. The importance of the WFPB lifestyle for society and for the world is momentous. Environmental problems, health (disease) care financing, unnecessary violence and earth resource utilization are at stake. To a substantial extent, each of these problems is based on what we choose to eat. Advancing this point of view requires a clear and comprehensive message that should not be told from one point of view, especially any that are based solely on deep personal values and absolutes. It is time we let scientific evidence speak for itself. Armstrong, D. and R. Doll (1975). “Environmental factors and cancer incidence and mortality in different countries, with special reference to dietary practices.” Int. J. Cancer 15: 617-631. Campbell, T. C. and T. M. Campbell, II (2005). The China Study, Startling Implications for Diet, Weight Loss, and Long-Term Health. Dallas, TX, BenBella Books, Inc.
Carroll, K. K. (1986). Experimental studies on dietary fat and cancer in relation to epidemiological data. Dietary Fat and Cancer. C. Ip, D. F. Birt, A. E. Rogers and C. Mettlin, Alan R. Liss, Inc.:231-248.